The Heretic’s Mother, and Other Heretical Notions! The issue of the recent interview I gave to Ynet continues to generate enough controversy it seems that my mother was finally asked by journalist to weigh in on it. She did so in a brief interview with the website Middle East transparent. To no one’s surprise, I hope, my Mom refused to disown me, which is always a good thing I guess. Thanks Mom. “My son is free in his political stances.” She also said. “I have never tried to impose any opinion on him.” Very true. Unfortunately though, she has to bear some of the burden associated with my own opinions. Sorry Mom. On a different note, I have to apologize for my lack of activity on the blog lately, and for failing to take issue with some of the recent Syria-related developments. No. I have not been exactly otherwise preoccupied, but I fear protestations at this stage will go nowhere. The momentum has simply shifted in favor of the “realists,” and their brand of realism needs to run its course. I fear the realists are far more righteous and morally indignant than the neo-cons, indeed, their ear drums are already cluttered with their mutual self-flattery and assertions with regard to the manifest correctness of their own assuredly ingenious ideas. They will not listen now. No. They are too busy being brilliant, in their own minds of course, to listen to those who will tell them that they are not, not by a long shot. We have to wait until such time when their brilliance become less self-evident to them, and their cluelessness becomes somewhat more admissible, then we might have a chance at giving them an earful, interspersed, hopefully, with some useful advice. One word of caution though, if the Bush Administration Democracy Campaign has gained America’s new enemies and cost it some friends, some of whom might have actually been real and useful, the realists’ Stability & Peace Campaign is bound to make matters even worse, namely: by offering America a few new back stabbing friends, losing her last few allies in the region, and re-emboldening the terrorists. After all, terrorists were not exactly the products of liberal democratic regimes, and the European-born exceptions that some usually trudge up here are primarily the products of enduring western racism vis-à-vis the migrant communities in their midst, more so than Middle Eastern politics. Be that as it may, the basic ethos of the game is still the same: the survival of the least hopeless and dumb in a world that is becoming more and more hostile to the merest hint of sanity and sobriety. In 1998, only 219 Syrians voted against Hafez Assad's government. One of them was Ammar Abdulhamid. Now exiled and awaiting political asylum in US, Syrian opposition leader talks to Ynet in exclusive interview. WASHINGTON – In a national referendum held by late Syrian President Hafez Assad in 1998, only 219 people voted against the government. One of them was Ammar Abdulhamid, 40, a Syrian opposition activist, exiled from Damascus in 2005 and currently awaiting political asylum in the United States. "The security agents give you a paper with a circle saying 'yes' and a circle saying 'no.' I voted 'no', and the person in front of me was shocked. He said, 'Look, you made a mistake. You said 'no' to the president.' He thought I had made a mistake. We expected for some time that somebody would come and say, 'Come with me', but it didn't happen. For 219 people, they didn't give a damn." In his first interview with an Israeli news agency, Abdulhamid tells Ynet how he frequently took risks, wrote articles against the president and generally pissed off the Syrian administration, until they got tired of him and showed him the door. In Washington he serves as representative of the National Salvation Front (NSF), a Syrian reform group operating abroad against President Bashar Assad’s regime. So why didn’t they show him to a prison cell instead of deporting him? 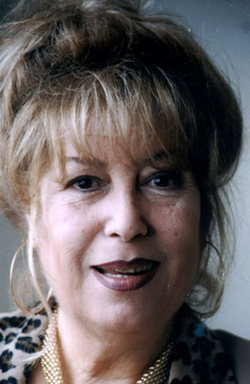 Abdulhamid believes it is because his mother was superstar actress Muna Wassef, one of Syrian’s most famous TV celebrities. “It wasn’t easy to arrest the son of such a famous and popular actress,” he says. With long brown hair tied back in a ponytail and an easygoing demeanor, Abdulhamid isn’t exactly how one might imagine a Syrian reformist. His English is refined and he demonstrates impressive knowledge. He declares that he doesn’t believe in God and he has no qualms about talking with Israelis. The first time he left Syria’s borders was in 1986, when he came to the United States to study at the University of Wisconsin. He returned to Damascus in 1994, but after a decade relocated to the US again, this time on a research fellowship at the Brookings Institute in Washington, DC. At the end of the fellowship, he returned to Syria – a rather surprising move considering the vehemently anti-Syrian articles he published while in Washington. How did you become an enemy of the Syrian regime? "They told me to leave, over a variety of issues. Apparently the project I was doing was a main issue. It was on majority-minority relations. So I am basically trying to create grassroots dialogue between different sects. I started in 2001, but officially in 2003." So what did you do that was so wrong that they told you to leave? "We were accused of fomenting the very thing we were trying to combat, which is sensitivities between the majority and minority. But I think what they are afraid of is these issues being raised at the popular level and being resolved at the popular level because our regime survives by exploiting the fears between the sects." In 2004 he left for Washington, where he wrote for the English-language Lebanese newspaper the Daily Star. He wrote a joint article with Israeli professor Moshe Maoz on the need to renew the Israeli-Syrian peace process. It was the first time a Syrian and an Israel had written something together which appeared publicly. Despite his severely critical writings, Abdulhamid returned to Syria. He said he didn’t want to make trouble, and even made a commitment to hold his pen and stop writing against the regime. The quiet lasted until the regime arrested a group of Syrian intellectuals, followed shortly thereafter by the assassination of former Prime Minister Rafik Hariri, and Abdulhamid could no longer keep quiet. “I was a loud-mouth, I couldn't control my tongue. When Hariri was assassinated a lot of people started pouring into Syria and asking questions, 'Who did it?' and whatever, I was very clear that I thought the the president was behind it. And I was very clear in calling him a moron in a number of interviews, and I think that was always not a good move. I was in Damascus calling the president of my country, which is a dictatorship basically, a moron. Why didn't they arrest you? After that meeting, Abdulhamid was invited to meet Shawkat, Assad’s brother-in-law, who is suspected to have been thickly involved in Hariri’s murder. “I had a meeting with Shawkat - my wife insisted on coming with me, so instead of having an interrogation you have a social event, and he tries to sort of contain the situation. I was under a travel ban at the time, so they lifted the travel ban and I promised to stop writing and simply to work quietly.” But Abdulhamid didn’t keep his mouth shut for long, and the regime started getting tired of him. ” Together with his colleagues from the Muslim Brotherhood, Abdulhamid founded the National Salvation Front, an umbrella organization of opposition groups working for the democratization of Syria. Former Syrian vice president Abd Al-Halim Khaddam is apparently closely associated with the Front. What relation do you have with Khaddam, who was part of the corrupt dictatorship? What is your stance on Israel? "The Muslim Brotherhood, by the way, said they prefer a negotiated settlement with Israel. They are not calling for Jihad to return the Golan (Heights). They went public on it, and I was very surprised nobody in the media picked up on it. And the head of the Muslim Brotherhood, Sadr Al-Din al-Banouni, said it very clearly in an interview on al-Jazeera. This is exactly why we decided we can talk to the Muslim Brotherhood. "We simply cannot ignore the Islamists. We are talking about change, about democracy, about elections at one point in time. So it's really good to sit down to realize with whom we can talk and how much they can moderate their language, and what sort of deals we can arrive at. Because either we do this or we have two other options: Either we talk to the Islamists and find moderates and work together for change at the risk of being betrayed. The other options are to stick to the status quo but then the status quo cannot hold a lot with the Assads. "The final analysis is that they are a minority regime, they are dictators, and they are not addressing any of the country's problems … and had they been good, slightly enlightened, I would never be in the opposition. It is much better to work with a slightly enlightened regime than to risk the chaos that comes with change. So we either continue to cooperate with a regime that will continue to abuse the system or we resort to violence ... All we want is support were do not want someone to do the work for us … As long as we are building networks, and we know we are creating realities on the ground, I don't care if it takes ten years. Why did you agree to do an interview for the Israeli media? "Many Israelis are wondering whether they should talk to Assad or not. I said at one point they cannot deliver what he wants because sooner or later this regime is going to fall. Because it represents a very small group of people, because it is corrupt, because the economy in Syria is imploding, poverty is rising, the Kurdish-Arab divide is widening, the Sunni-Alawit divide is widening. So sooner or later it is going to pass either peacefully or violently. "I hope for peace and if it is going to be violent I don't want to have anything to do with it. I really want Bashar to become a genius overnight, I really do. Even if he killed Hariri, I believe that, I am willing to forgive so many things, just to save us a violent solution for the country and to have some sense of reform. We do need to begin tackling the Sunni-Alawit divide because the more they postpone it the more it is going to get violent."